Hiya guys! 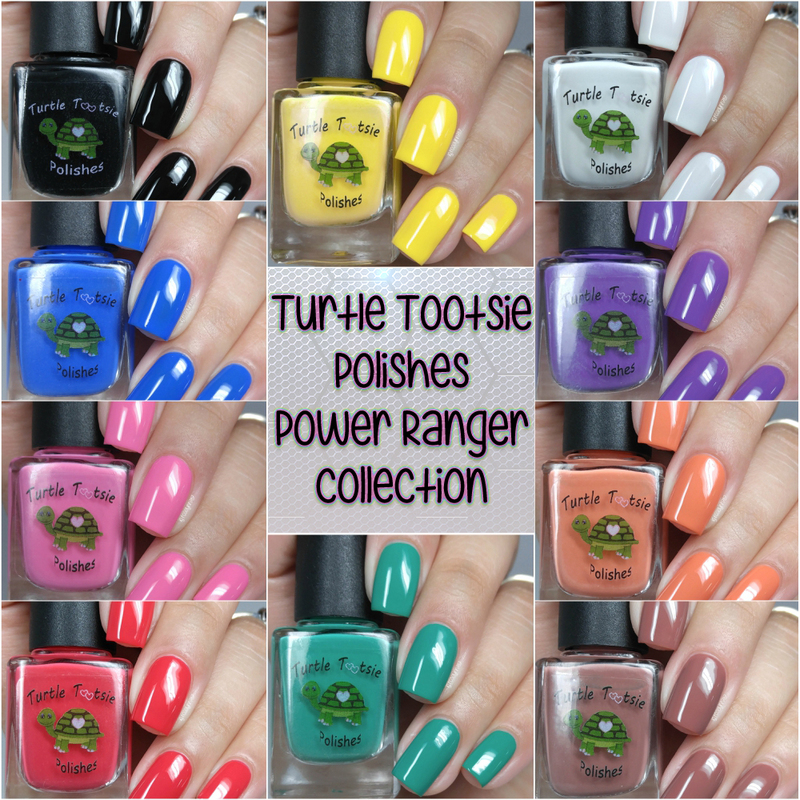 Today I'm sharing swatches for the Power Rangers Collection by Turtle Tootsie Polishes. 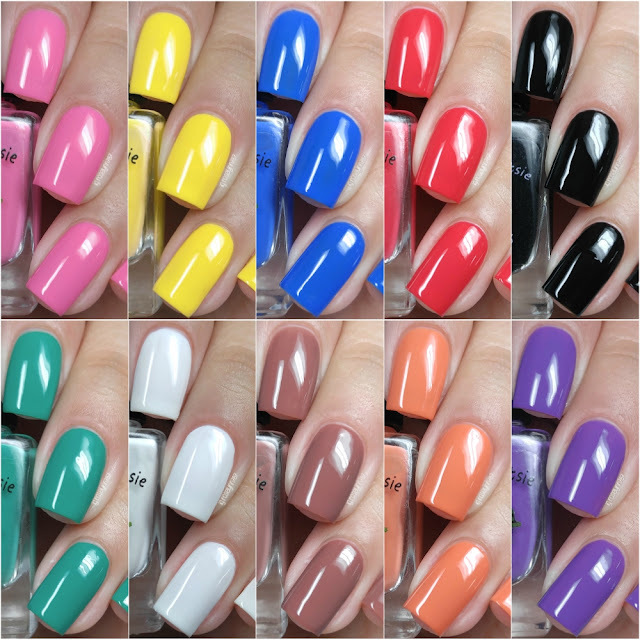 The collection was created with the fabulous Ann from Mani on the Move to celebrate her one year blog anniversary. Now this is a huge collection consisting of ten creams and one holo glitter topper. Initially the collection consisted of only the original six Power Rangers (black, blue, pink, red, yellow, and green), but Chrissy then decided to expand to include the forgotten Rangers as well. Fair warning, this is an extremely photo heavy post as I'll be sharing the collection in its entirety. Without further ado, it's morphin time! 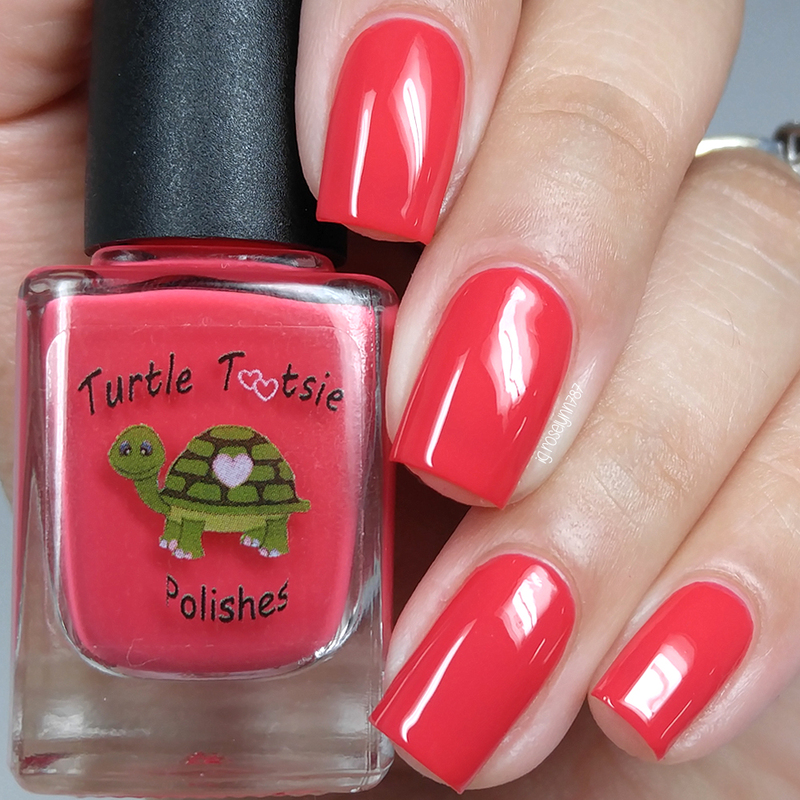 The Power Rangers Collection by Turtle Tootsie Polishes will be available for purchase Friday, September 9th at 8pm EST. Each full-size (12mL) bottle will retail for $9.00 and the mini-size will retail for $5.00. Being as these are all creams they do share (for the most part) the same easy to apply formula and thin consistency. None of these are opaque enough to be one coaters, but they do layer smoothly for an opaque finish. Very good self-leveling, especially with Blue, Red, and Purple Ranger. All of them dry to a nice shine on their own as well. Ready for the best part about this collection?! It watermarbles! Yes, with the exception of the holo topper of course, all the creams in this collection watermarble like a dream. I'll have a post up over the weekend with my watermarble (and video tutorial) so stay tuned. Pink Ranger can be described as a bright bubblegum pink cream. I have to start off with my favorite Ranger! As a little girl my whole room was decorated in the Pink Ranger stuff and I believe I even had the Halloween costume one year. Shown here in two coats and sealed with a glossy topcoat. Yellow Ranger can be described as a sunflower yellow cream. 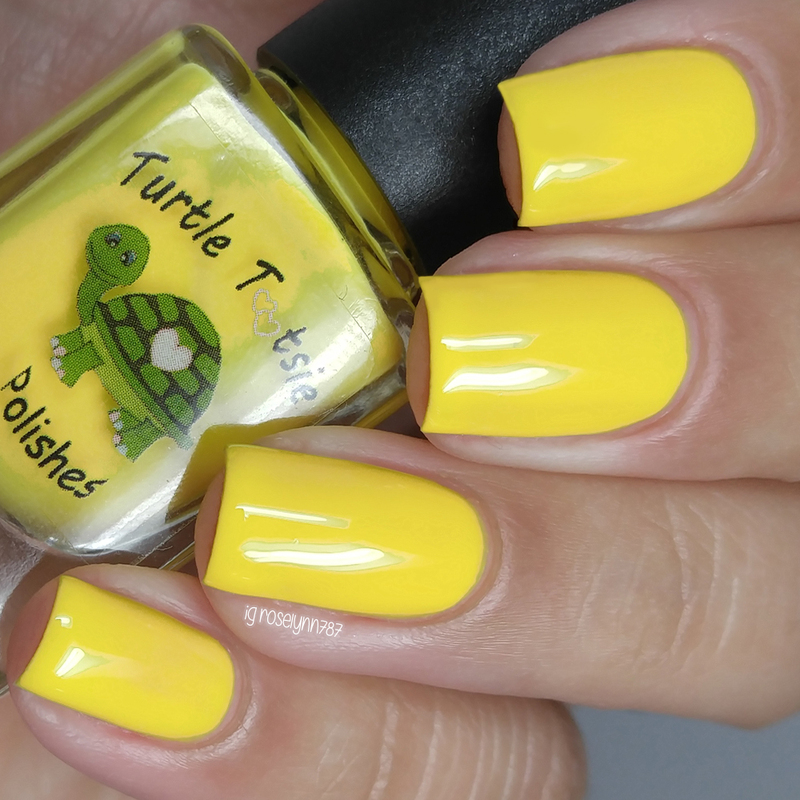 My readers will know I don't usually like yellow polishes, but there are always exceptions and this one definitely falls into that category. I love how bright this looks whilst still complimenting my skin-tone. The formula on this one is a bit more sheer than the majority as well as a little patchy. Self-leveling helped, but I did need to do three coats to get full coverage. 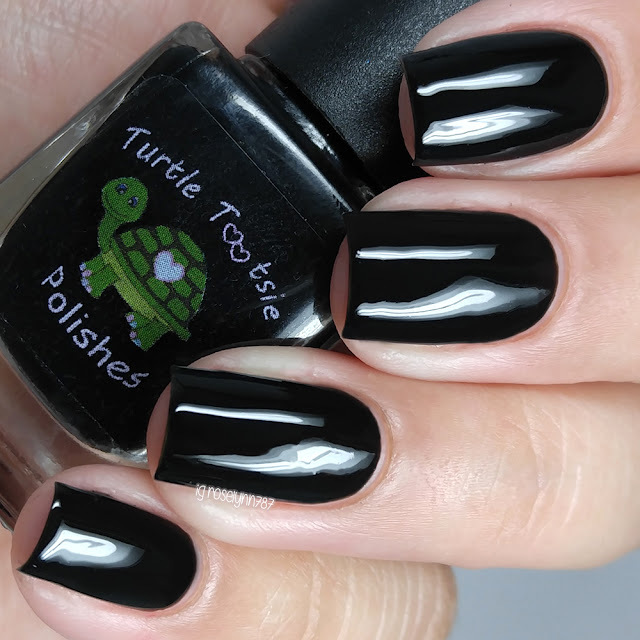 Shown here in three coats and sealed with a glossy topcoat. Blue Ranger can be described as a medium blue cream. 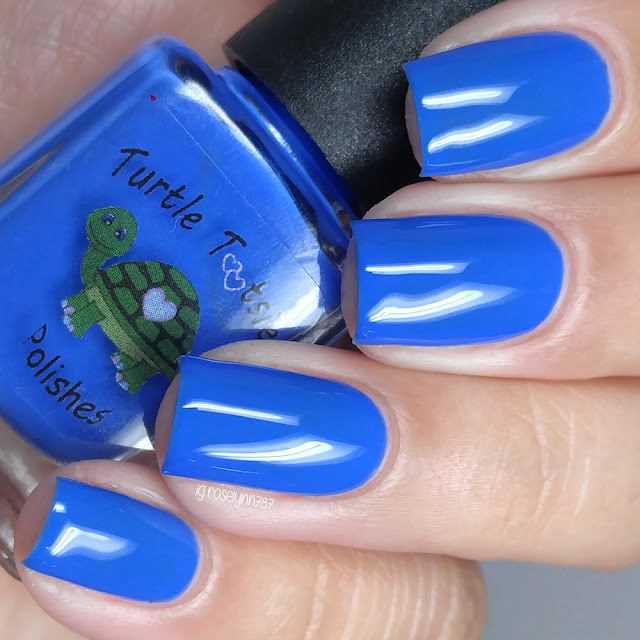 One of my top favorites from this collection, because I can never have too many blue shades. Also I experienced no staining, which is always nice for a blue tone. Shown here in two coats and sealed with a glossy topcoat. Red Ranger can be described as a cherry red cream. Shown here in two coats and sealed with a glossy topcoat. Black Ranger can be described as a onyx black cream. Like with Yellow Ranger, the formula for this one is also both patchy and sheerier than the rest. Shown here in three coats and sealed with a glossy topcoat. Green Ranger can be described as a jade green cream. I have to say I really love the tone of this green. It feels really unique to me, I definitely didn't have anything quite this tone in my stash. Shown here in two coats and sealed with a glossy topcoat. White Ranger can be described as a white cream. I'm always on the lookout for great one coater whites like I am with black polishes, but this one didn't fit my needs either. 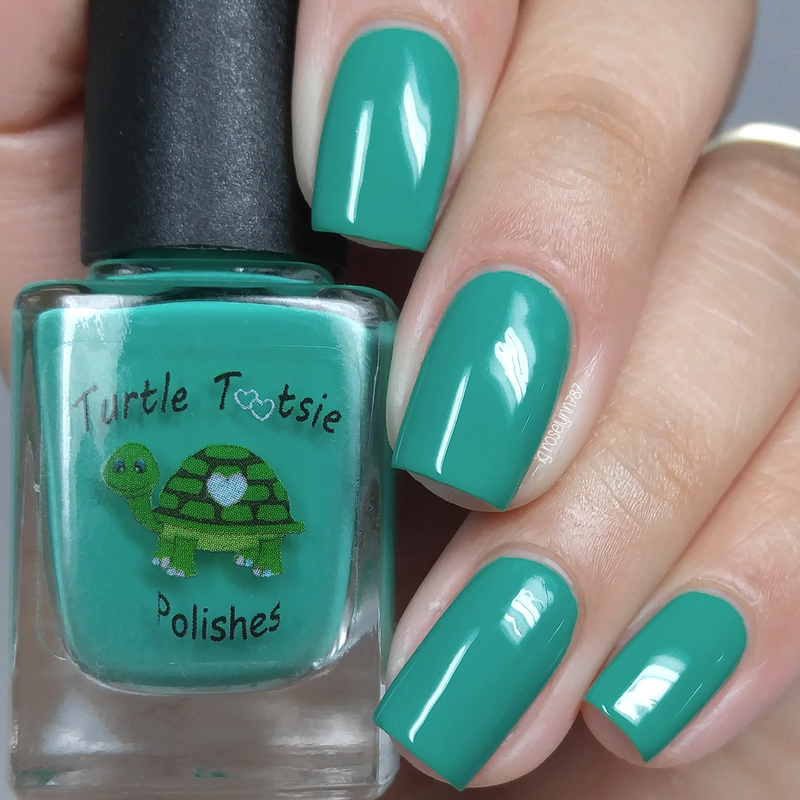 Formula wise this another one of the patchier shades in this collection. It needed a few coats to achieve a smooth and opaque finish. Shown here in three coats and sealed with a glossy topcoat. Brown Ranger can be described as a chocolate brown cream. I know most people are like. "What?! A Brown Ranger?! ", but yeah although he technically existed he never quite made it into the show. Anyway usually I really like browns on me, but this one felt a little too warm for my skin-tone. Shown here in two coats and sealed with a glossy topcoat. Orange Ranger can be described as a peachy orange cream. Shown here in two coats and sealed with a glossy topcoat. Purple Ranger can be described as a bright purple cream. Another one of my favorite creams in this collection, this purple just screams lush to me. Shown here in two coats and sealed with a glossy topcoat. Megazord can be described as a holographic topper filled with blue, black, yellow, red, and green glitters. I layered it here over White Ranger, but it can honestly go over any one of the creams in this collection just as flawlessly. The formula has a great distribution for the glitters and I didn't really feel the need to fish. The application does need a bit of dabbing to make sure the glitters don't clump. Shown here over a white base using two coats and sealed with a glossy topcoat. Overall the 90s kid in me can't help but love this collection so much. Creams are not usually everyone's cup of tea, but because I usually do a lot of nail art creams come really in handy for me. This collection especially hits a lot of in between tones in colors, which makes them feel unique to my stash. Definitely the best part about these is the fact that they can watermarble perfectly and I can't wait to show you. But what do you guys think of this collection? Let me know down in the comments who was your inner Ranger growing up! 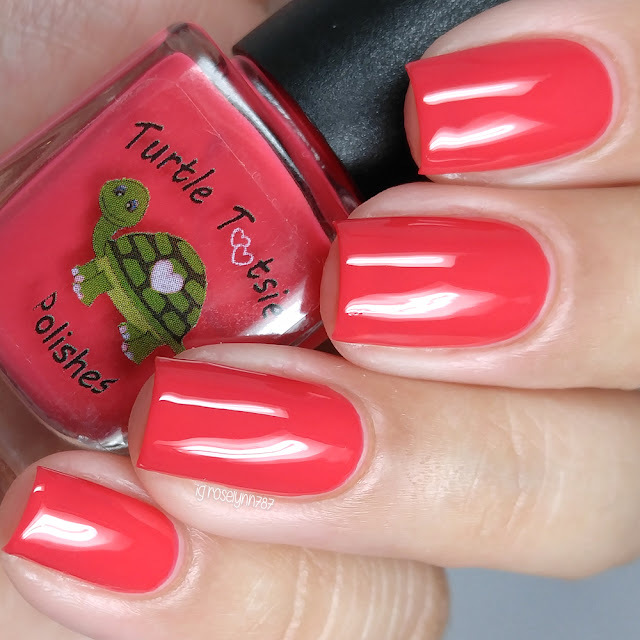 To recap, the Power Rangers Collection by Turtle Tootsie Polishes will be available for purchase Friday, September 9th at 8pm EST. Each full-size (12mL) bottle will retail for $9.00 and the mini-size will retail for $5.00. I love cremes! Reading the descriptions almost made me nostalgic for the old times. Pink ranger for life! What a great set of cremes! I love Green Ranger and Orange Ranger the most! What a stunning collection. I love your cuticles. Now I want this collection badly after read this post.